Ita was in 1986 that Sinopoli visited Japan for the first time when he conducted Manon Lescaut whit the Vienna State Opera and had given a fresh sensation. His visit to Japan with the Philharmonia Orchestra was realized in the following year 1987, when they performed a very energetic and avaricious program, Mahler, Brahms and Schubert Symphonies in addition to Madame Butterfly performed in concert style, as part of the Opening Series of the Suntory Hall that had opened in the previous year. 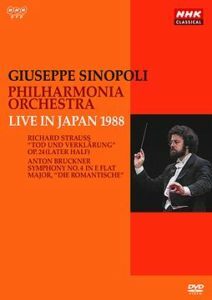 The performance featured on this DVD is the concert in Japan in September 1988, a portrait of Sinopoli at the age of 42. His personal appearance like a dignified philosopher itself was overwhelmed with inspiration and mission, unimaginable compared to any other conductors, and his pure looking eyes hid tremendous beauty. His performance of course, proudly heats up but it is most surprising that one can fell that Sinopoli never uses any tricks or devices to gain musical effects but his performance exists just for the realization of the world of the work itself, and that Sinopoli just lives in the works being the music itself. He speaks, murmurs, and sings by his natural voice, the life and its various emotions, despair and joy, dreams and illusions on behalf of the composer. The audience fell the emotions created by Sinopoli’s drama and become the hero of the music and enjoys the most emotional experience. One might fell that his Bruckner sound like Mahler, but Sinopoli clearly explains this in the interview footage featured on this DVD as a bonus track which one can not miss. It will not only help your appreciation of his music but will surprise you with how sharp his point of view is, and how clearly he could judge the reality of the composers. The commentary on R. Strauss “Tod und Verklärung” is full of his unique insight and the performance of the main parts of the work is edited and featured on the DDVD in a commentary style which has now become our precious legacy of the artist Sinopoli. The relationship of Sinopoli and Japan in around 1990 was very deep. In 1989, the year following the performance on this DVD, Sinopoli returned to Japan to conduct Wagner’s 3 operas ( “Tannhauser” , ” Lohengrin” and ” Parsifal”) as the Bayreuth Festival performance to celebrate the opening of the Orchard Hall, and in 1990, came back with the Phihlarmonia Orchestra to open the Tokyo Metropolitan Art Hall, conducting the complete Mahler Symphony in a short period of time and overwhelmed and touched the audience. He was truly the unforgettable Sinopoli, deserved more than a million thanks.